BILLFISH: It was definitely feast of famine this week but we can see the fishing is gradually getting better. More boats reported spotting multiple marlin but generally had a hard time getting them interested in bait. On the other hand we had some boats that did exceptionally well. Catch of the week has to go to Tracy Ann and for anglers Jason Jones, Steve Hawkins & Fred Gabel from Chico, California. On March 26th this trio was fishing at Cerros de Arena on the Pacific side when they hooked a black marlin – very unusual for this time of year- the fish was estimated at 210 lbs. and released healthy; they then went on to release two striped marlin in the 60 to 100 lbs. class. All three fish took like caballito –t hanks guys for releasing all three fish. Not far behind Tracy Ann this week was the ever popular Rebecca who had an outstanding day on March 25th for a group from Oceanside, California, when they released FOUR striped marlin between Margaritas and Los Arcos. The fish were between 80 and 110 lbs. and were hooked on live bait. Another boat that did very well earlier in the week was La Brisa with Bart Findley and friends on board from Blue Springs, Mo. They went up quite a way up the Sea of Cortez coastline, to Destiladeras where they managed to release three striped marlin in the 60 to 130 lb. class. These catches show that the marlin are on the small side, so it looks like there are a lot of juveniles around. There were several boats that had double marlin days though quite a lot of boats were “skunked” too. These catches give us hope that the billfish catches will stabilize soon and become more consistent as the watchword lately has been “inconsistent”. Pisces anglers caught a total of 35 billfish this week with 34 released. 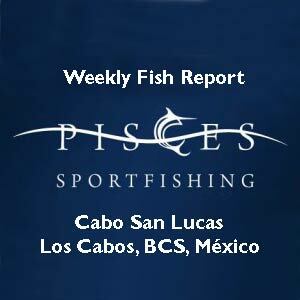 This entry was posted in cabo san lucas, Fish Reports, Pisces Sportfishing, sportfishing on March 30, 2015 by Roger.